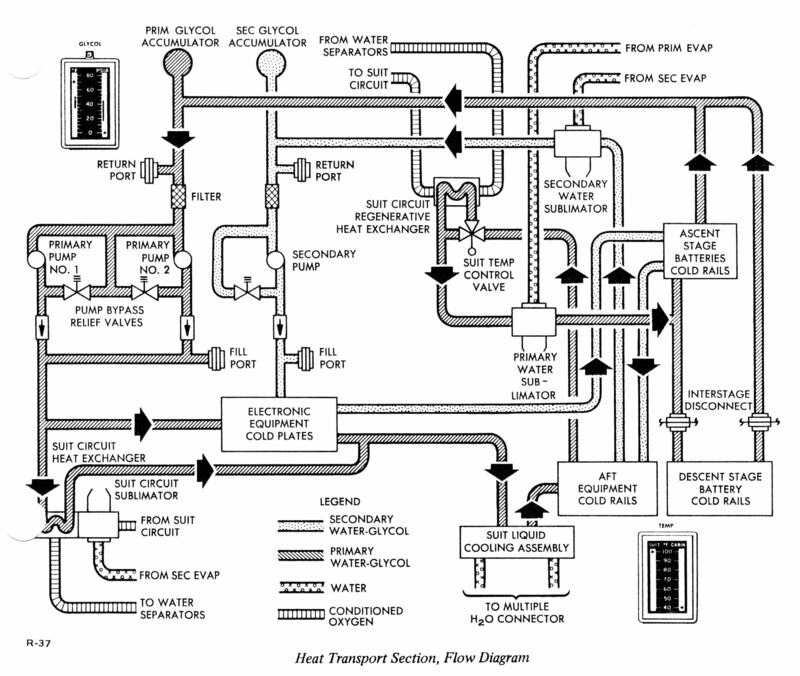 The HTS consists of two closed loops (primary and secondary) through which a water-glycol solution is circulated to cool the suit circuits, cabin atmosphere, and electronic equipment. Coolant is continuously circulated through cold plates and cold rails to remove heat from electronic equipment and batteries. For the purpose of clarity, the primary and secondary coolant loops, and the primary and secondary coolant loop cold plates and rails are discussed separately in the following paragraphs. When necessary, the primary loop is also a heat source for the cabin atmosphere. Heat is removed by absorption and is rejected to space by process of sublimation. Click here for a 612k version. The primary coolant loop is charged with coolant at the fill points and is then sealed. The glycol pumps force the coolant through the loop. The glycol accumulator maintains a constant head of pressure (5.25 to 9 psia, depending on coolant level) at the inlets of the primary loop glycol pumps. Coolant temperature at the inlets is approximately +400 F. A switch in a low-level sensor trips when only 10� of coolant volume remains in the accumulator. When tripped, the switch provides a telemetry signal and causes the glycol caution light to go on. The coolant is routed to the pumps through a filter. They are started by closing the appropriate circuit breakers and setting the glycol selector switch to pump 1 or pump 2. If the operating pump does not maintain a minimum differential pressure (&#Delta;P) of 7�psi, the &#Delta;P switch generates a signal to energize the ECS caution light and the glycol component caution light. Selecting the other pump de-energizes the lights when the onstream pump develops a minimum &#Delta;P of 5.0 to 9.0 psi. If both pumps fail, the secondary loop is activated by setting the water tank selector valve to the secondary, setting the glycol pump switch to INST (SEC), and closing the glycol pump secondary circuit breaker. Automatic transfer to primary pump No. 1 to primary pump No. 2 is initiated by closing the glycol automatic transfer circuit breaker and setting the selector switch to pump 1. When transfer is necessary, the caution lights go on, the transfer is accomplished, and the ECS caution light goes off. The glycol pump component light remains on. If primary loop &#Delta;P exceeds 33 psi, the pump bypass relief valve opens and routes the coolant back to the pump inlet, relieving the pressure. The valves start to open at 33 psi, are fully open at a maximum of 39 psia, and reseat at a minimum of 32 psia. Check valves prevent coolant from feeding back through an inoperative primary pump. Part of the coolant leaving the recirculation assembly flows to the suit circuit heat exchanger to cool the suit circuit gas of the ARS. The remainder of the coolant flows to the electronic equipment mounted on cold plates. The flow paths then converge and the coolant is directed to the liquid cooling garment water glycol heat exchanger to cool suit water as required. The coolant then flows through the aft equipment bay cold rails. A portion of the warmer coolant flow can be diverted to the suit circuit regenerative heat exchanger through the suit temperature control valve to increase suit inlet gas temperature. The diverted flow returning from the heat exchanger, combined with the bypassed coolant is routed to the primary sublimator. The sublimator decreases the temperature of the coolant by rejecting heat to space through sublimation of water, followed by venting of generated steam through an overboard duct. Deflector plates, attached to the duct, prevent escaping steam from applying thrust to the vehicle. Water is fed to the sublimator at a pressure that exceeds 4.0 psia, but is less than 6.5 psia. The water pressure must be less than the suit circuit static pressure plus the head pressure from the water separators to the sublimator. The water regulators, referenced to suit circuit pressure, are in the water feed line to the sublimator. Regulated water pressure varies from 0.5 to 1.0 psid above suit circuit pressure. The sublimator inlet outlet temperatures are sensed by temperature transducers, which provide telemetry signals. Coolant from the sublimator flows through the ascent and descent battery cold rails, then returns to the recirculation assembly. Two self-sealing disconnects upstream and downstream of the glycol pumps permit servicing of the HTS. Interstage disconnects are installed in coolant lines that connect to the descent stage. Before staging, coolant flows through the ascent and descent stage battery cold rails. After staging, the interstage disconnects separate, the lines are sealed by spring-loaded check valves, and the full coolant flow enters the ascent stage battery cold rails. The secondary (emergency) coolant loop provides thermal control for those electronic assemblies and batteries whose performance is necessary to effect a safe return to the CSM. Cooling is provided by the secondary sublimator. As in the primary loop, a secondary glycol accumulator provides pressure for the pump inlet side and compensates for loss due to leakage. A pump bypass relief valve relieves excessive pressure by routing coolant back to the pump inlet. A check valve at the discharge side of the glycol pump prevents coolant flow from bypassing the HTS during GSE operation. The coolant from the pump passes through the check valve to the secondary passage of the cold plates and cold rails of the electronics and batteries cold plate section. Waste heat is absorbed by the coolant. The warm coolant then flows to the secondary sublimator. The secondary sublimator operates in the same manner as the primary sublimator in the primary coolant loop. Water for the sublimator is provided when the secondary evaporator flow valve is opened. The coolant returns to the pump for recirculation. Equipment essential for mission abort is mounted on cold plates and rails that have two independent coolant passages, one for the primary loop and one for the secondary loop. 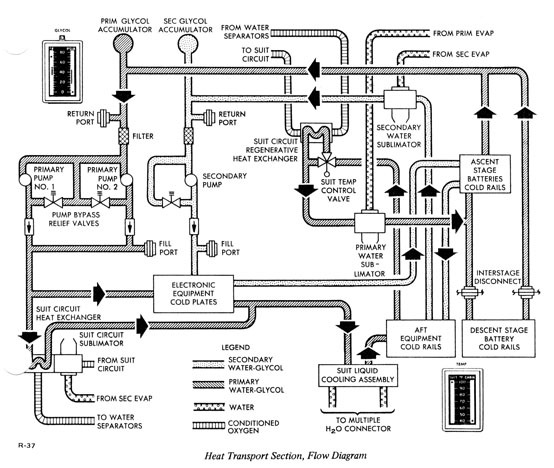 The cold plates and rails in the primary coolant loop are arranged in three groups: upstream electronics, aft equipment bay, and batteries. Coolant from the recirculation assembly flows into parallel paths that serve the upstream electronics cold plate group. In this group, the data storage electronics assembly (DSEA) is cooled by cold rails; the remainder of the electronics, by cold plates. The cold plates are in the pressurized and unpressurized areas of the LM. The flow rates through the parallel paths are controlled by flow restrictors, installed downstream of the cold plate group. The first upstream electronics flow path cools the suit circuit heat exchanger. The second flow path cools five cold plates mounted on the pressurized side of the equipment tunnel back wall. The third path serves the integrally cooled IMU and the rate gyro assembly (RGA) cold plate, both located in the unpressurized area (on the navigation base). The fourth path cools the abort sensor assembly (ASA) and pulse torque assembly (PTA) cold plates. All the plates for the fourth path are in the unpressurized area above the cabin; the ASA is on the navigation base of the alignment optical telescope (AOT). The fifth path serves the tracking light electronics (TLE), gimbal angle sequencing transformation assembly (GASTA), lighting control assembly (LCA), and DSEA plates: one in the unpressurized area in front of the cabin, a second one in the control and display panel area, a third one below the cabin floor, and another one on the left wall of the cabin. The aft equipment bay is cooled by eight cold rails; the flow is in parallel. The batteries are cooled by cold rails. The ascent batteries are in the center section of the aft equipment bay; the descent batteries are in quads 1 and 4 of the descent stage. During the descent phase, the coolant flow is split between the descent batteries and the ascent batteries; the ascent batteries are not used during this time. When the stages are separated, quickdisconnects break the coolant lines and seal the ends; all coolant then-flows through the ascent battery cold rails. The secondary coolant loop is for emergency use. Only cold plates and cold rails that have two independent passages (one for the primary loop and one for the secondary loop) are served by this loop. In the upstream electronics area, the secondary coolant flow is split between three cold plates (RGA, ASA, and TLE) in parallel. The flow rate is controlled by a flow restrictor downstream of the TLE and RGA. After these three plates, the secondary loop cools the ascent battery cold rails and the aft equipment bay cold rails in a seriesparallel arrangement. The coolant first flows through three ascent battery cold rails in parallel, then through eight aft equipment bay cold rails in parallel.